Download the app in the Apple App Store or Google Play Store. 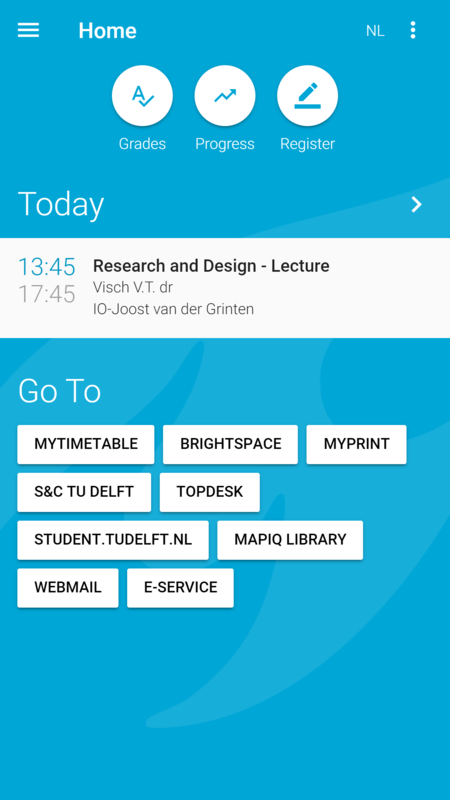 The name of the app: MyTUDelft. Osiris and MyTimetable are the sources of the information that is presented in MyTUDelft. Do you have any questions or do you need assistance in using MyTUDelft, please contact Ecutation and Student Affairs contactcentre-esa@tudelft.nl. This system (MyTUDelft) and its associated sub-systems (My.timetable and Osiris) is for the use of those authorized by Delft University of Technology at Delft in The Netherlands. While this University strives to make the information on this system as timely and accurate as possible, the university makes no claims, promises or guarantees about the accuracy or completeness or adequacy of its contents and expressly disclaims liability for errors and omissions therein. All activities on this system may be subject to monitoring and testing. Use of this system constitutes consent to monitoring of the system and the user’s acknowledgement of accountability and responsibility. Authorized users may only perform authorized activities and may not exceed the limits of such authorization. Disclosure of information found in this system for any unauthorized use is strictly prohibited. Intentional misuse of this system can result in criminal prosecution.